Have you ever put an outfit on and were just totally feeling yourself? This is my outfit that gives me a little extra strut in my stride. While I’ve been trying to break out of my normal dark color palette, this all black ensemble was too fabulous to pass up. The top was an $8 score from the Kohl’s clearance rack, and I love both the length and the chunky knit. It paired perfectly with my brand new Margaret M pants from their spring line. 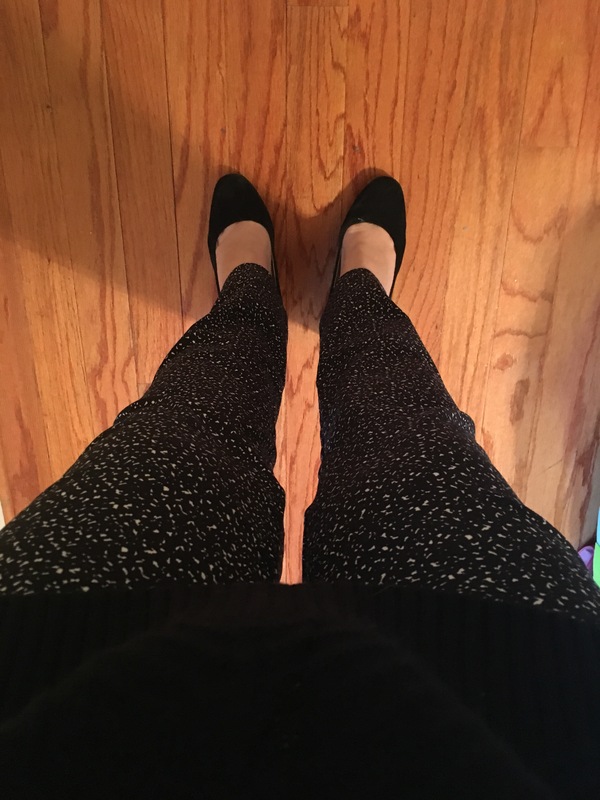 I’m so thrilled that these amazingly flattering pants are now sold through their website, and I no longer have to bribe my Stitch Fix stylist for a pair. As we’ve mentioned in the past, at $100 they are a bit of an investment piece, but well worth the price. I love the versatility of this black and white patterned pair. While I kept it simple and chic today with a black sweater, I can already envision it with a colored top or blazer and if I really get adventurous, will try my hand at pattern-mixing. Pants: Margaret M, the pants that look good on seriously everyone! #OOTD, Reader Submission: Work It Girl!